Assigning social constructs to neutral stimuli – like the spectrum of light reflection that causes color – can be argued to have an effect on our own perceptions. When projected bias is cast onto elements that are neutral in context, lasting connotations exist. Pink Noise: Flexing The Frequency, the current exhibition at Girls’ Club, on view until Saturday, February 25, 2017, challenges the dynamic of a color that has been used to symbolize feminine qualities. The color pink has been assigned a gender and as societal norms have advanced, so too has the color’s meaning evolved. I was interested in discussing how these intricacies have played part in peoples’ lives. There is a discourse that can occur in regards to social constructs that result in gaining insight on our own perspectives. Examining the lessons learned or emotions felt about a color, can help identify patterns in problematic social thinking; it can also shed light on the positive. Minimizing the intent of marketed tactics or belittling the effects, perpetuates misguided thought. We have to actively, consciously separate from these outdated traditions, to relieve our obliged view of color. Consciously or unconsciously, these in-observable variables are intertwined in our daily activities. Stereotypical characteristics are also assigned based on professional practices. In Pink Noise Perspectives, interviewed individuals candidly speak about the color and its effects on their professional work and in their personal lives. Dr. Rhea Butchey is an optometrist from Davie, FL. Inspired by her personal experiences with glasses and her optometrist as a child, Dr. Butchey found her calling to optometry at a young age. Dr. Butchey kept that promise and went on to receive her Bachelor of Science degree at the University of Central Florida in Orlando, FL and her Doctorate of Optometry at Nova Southeastern University in Fort Lauderdale, FL. As a working professional, Dr. Butchey is part of the Florida Optometric Association as well as the Broward County Optometry Association. 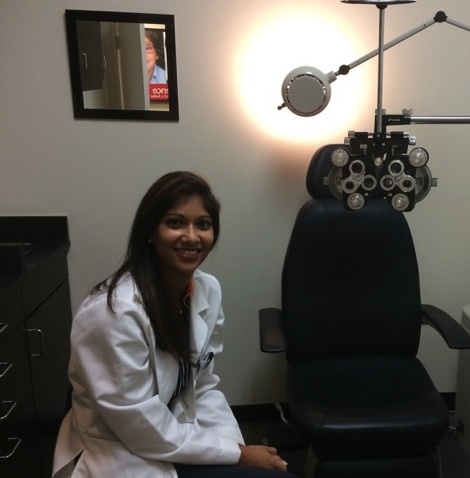 She works as an independent Doctor of Optometry inside of Visionworks in Fort Lauderdale. She has been practicing optometry for 3 years. Dr. Butchey’s practice is located at 2131 N Federal Hwy, Fort Lauderdale FL 33305. Keep up with her practice by visiting Dr. Butchey’s Facebook. For more information she can also be reached at (954) 565-8274. Bryan Adams is a musician, producer, and founder of the Figbox, a commutative artist collective based in Davie, FL. Figbox derives from the term ‘moldy figs,’ a pejorative term for jazz purists back in the 1920s who preferred traditional jazz to bebop and swing. Figbox is more than a recording studio where artists and musicians create and release records; those who belong to the community collaborate and blend their ideas in video formats, hip hop performances and in genre bending projects. Figbox is home to roughly 20 or so bands or recording projects, most of which are started in collaboration with some of the same people. Bryan has been writing and producing music for over 10 years. He has performed in local bands as well as solo acts in the tri-county area of South Florida. He is a vocalist and multi-instrumentalist. As the producer at large at Figbox, he records tracks and engineers the sound of each respective sound. 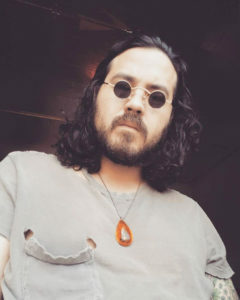 Raphael Alexis Alvarez is a musician living in Charlotte, NC. 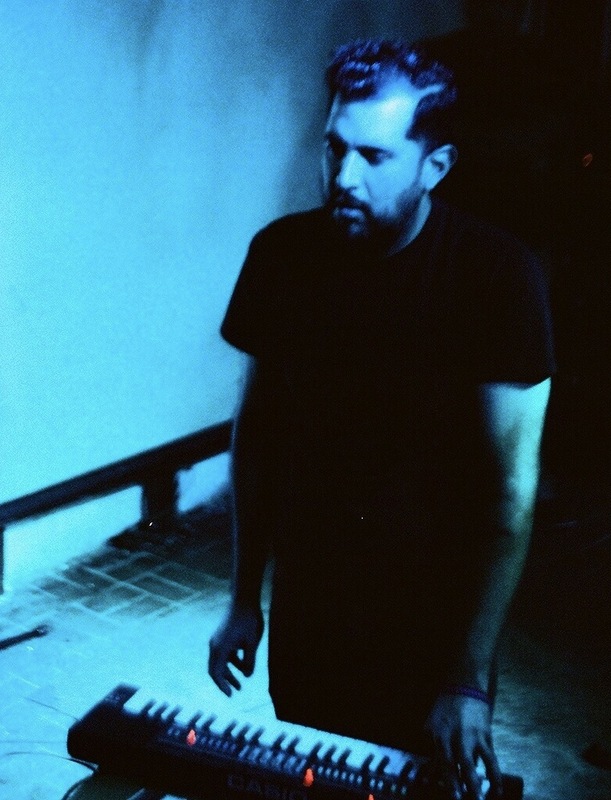 Born in Louisiana but raised in southern Florida, he has performed in bands as well as solo efforts throughout the experimental/noise community in Broward and Miami-Dade county. As a noise artist, Raph manipulates sounds, tones, and frequencies that result in a cathartic experience for artist and listener. He finds inspiration from various interactions with sounds and produces music that involves recreating these specific interactions. His current project, Odd Queer, blends rhythmic elements, processed vocals, and some improvisation. Andrea Salomone is an elementary school teacher, teaching in the Broward County school system for 5 years. Her passion is playing and producing music. Playing since the age of 9, Andrea is a multi-instrumentalist. 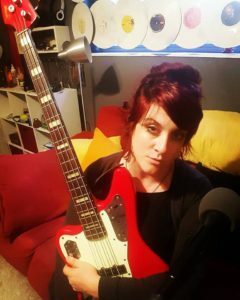 Her main love of the bass, but she also commands the guitar, drums, and piano; and sing lead vocals for her band Papaya Whip. For the last two years, she has been an educator/collaborator at Miami Girls Rock Camp, which is a non-profit, week-long day camp that encourages girls to rock in South Florida! With her spare time, she produces music for local artists and her own experimentations. She sings lead vocals and plays the bass for her most recent project, Papaya Whip, a three-person band based out of Broward County. The Pink Noise Perspectives podcast series is recorded at her space, Swellout Studios, Pembroke Pines. Check out more of Andrea’s music on Swell Out Studios SoundCloud. Pink Noise Perspectives premieres at the closing reception for Pink Noise: Flexing The Frequency. Join us for the kick off event and entertain your ear drums with the first episode in this six part series. The listening station will be held up stairs in the Girls’ Club mezzanine. Tayina Deravile is a budding cultural arts administrator from Coral Springs, FL by way of Framingham, MA. Interested in the dynamics of the mental psyche and human behavior, Tayina attended the Universtiy of Central Florida, Orlando, FL to receive a Bachelor of Science degree in Psychology. Her intrigue and curiosity in the conscious and unconscious thought, led her to further her education in the social sciences, with a Master’s degree in Mental Health Counseling at Nova Southeastern University, Fort Lauderdale, FL. While attending graduate school, Tayina began her career in art administration at the NSU Art Museum. During her tenure at the museum, Tayina was able to facilitate outreach programs, studio art classes, and engage the community through the education department initiatives. As a proponent for beneficence, she views multidisciplinary art education as an engaging catalyst for well being. 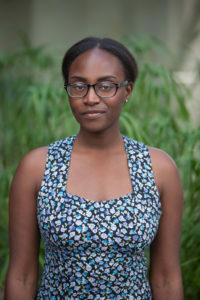 Her background in psychology and experience working with art institutions furthers her belief that art is essential in an individual’s overall mental health. As a fellow, Tayina provided considerable support in outreach programming in events such as SPF ’16, Now Be Here, and Lop-Off Session. She also sustained administrative duties as needed. More about Tayina Deravile’s projects as Girls’ Club Winter/Spring 2017 fellow available at www.girlsclubcollection.org/hello-fellow-tayina-deravile.